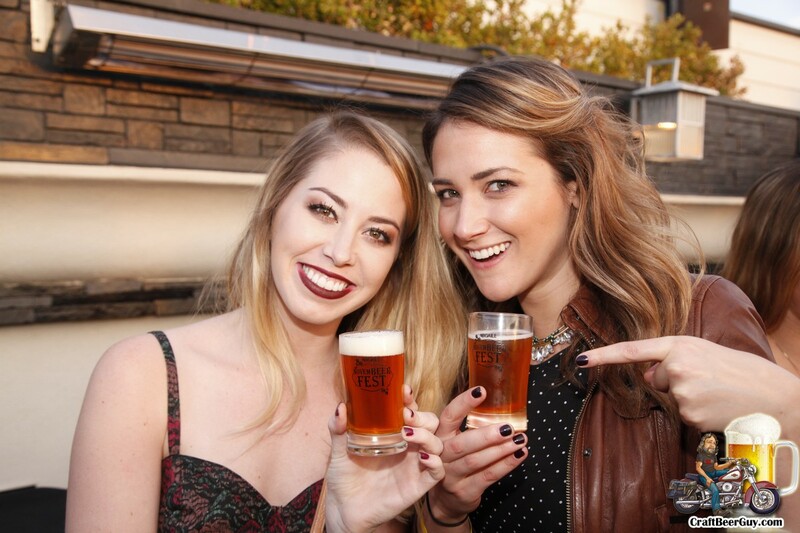 On Wednesday evening, Hermosa Beach brewpub The Brewery at Abigaile held another of their delicious Brewery Dinners, this time featuring Stone Brewing Company. The event was attended by a couple dozen craft beer fans and we were all treated to quite a meal with the food menu put together by Chef Tin and Chef Jorge. It is no secret that I am a big fan of Abigaile Restaurant and The Brewery at Abigaile, not only for the fine beers produced by Brian Brewer but for the food that comes out of their kitchen. It is pretty easy to see that the food menu is meant to compliment Brewer’s brews. 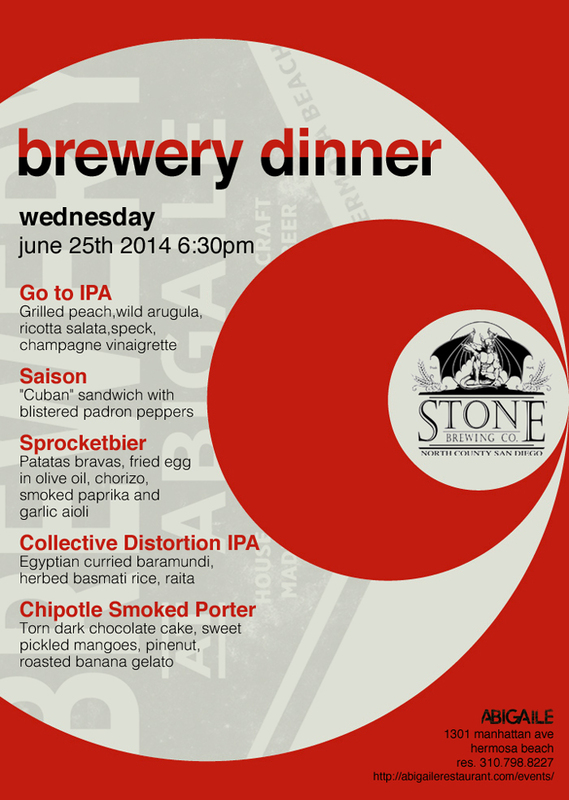 On Wednesday June 25 the Abigaile kitchen will pair their foods with Southern California craft beer icon, Stone Brewing Company. The five course meal will feature Stone’s Go to IPA paired with a grilled peach and arugula salad, Stone’s Saison paired with a Cuban sandwich, Sprocketbier paired with Patatas bravas, Keri Kelli/Kyle Hollingsworth/Stone Collective Distortion IPA paired with Egyptian curried baramundi and for dessert, Chipotle Smoked Porter paired with torn chocolate cake, sweet pickled mangoes, pinenut and roasted banana gelato. Having attended a couple beer dinners at Abigaile I think it is safe to say that there could be some special surprises in store as Brewery at Abigaile head brewer, Brian Brewer will be joining us to answer all your beer questions. 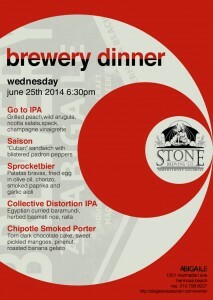 The Stone Brewery Dinner will begin at 6:30 PM on June 25; tickets are $68.00 each plus tax and gratuity. 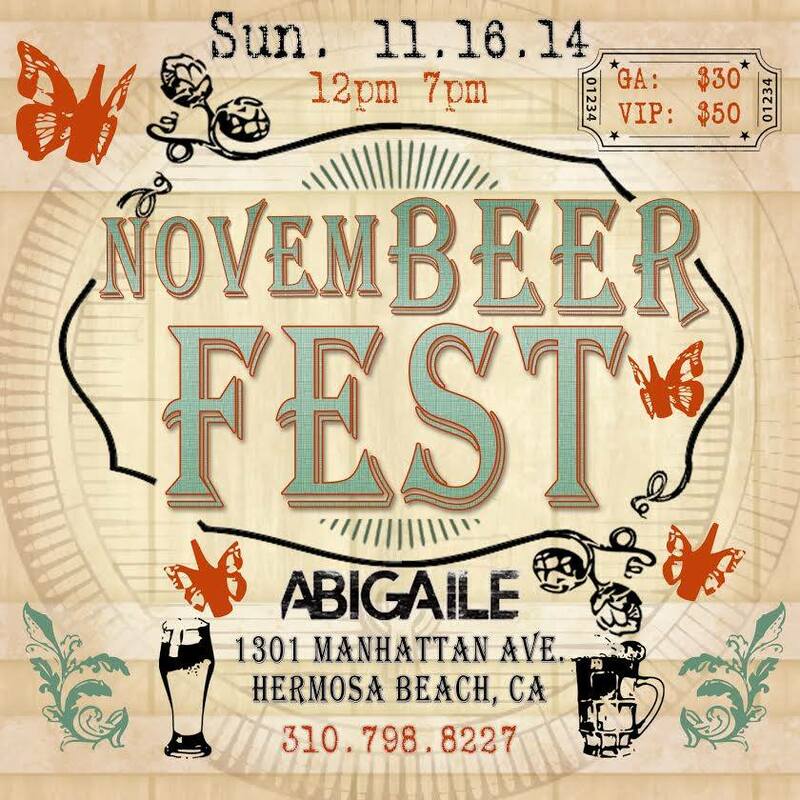 There are limited tickets available so if you want to guarantee a seat or two you can purchase your tickets ahead of time by sending an email to abigaile.specialevents@gmail.com or by calling (310) 798-8227 (ask for Kyle). You can also buy them at Abigaile ahead on time or if you feel lucky you can try coming down Wednesday evening and ask if there are any seats available. 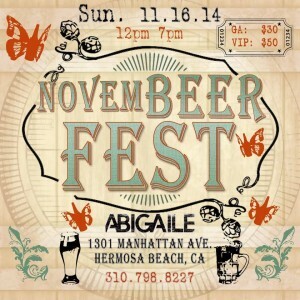 Personally, I would not risk it; get your tickets early and be guaranteed a fun time with great beers and amazing food. You will not be disappointed; I hope to see you there. 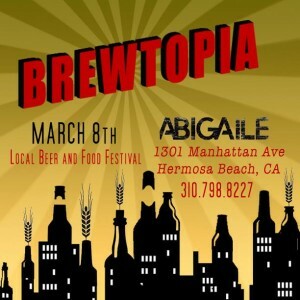 The Brewery at Abigaile is located at 1301 Manhattan Avenue in Hermosa Beach. That is at the northwest corner of Manhattan Avenue and Pier Avenue. They do have underground parking for your convenience. Cheers!